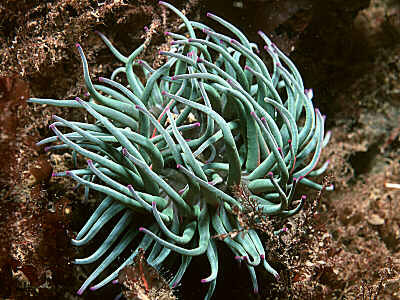 Description: The long, sinuous tentacles of this sea anemone are rarely retracted (although retractile). The column is smooth, with a row of inconspicuous warts on the rim of the parapet. The colour of the column is brownish or greyish; tentacles are similar or bright green, usually with bright purple tips and red bases. Span of tentacles up to 200mm but usually less than that in British specimens. Habitat: Usually found in open situations exposed to the light. On the shore in pools, on rocks or sea-weed (eel-grass or kelp) and in the shallow sublittoral down to about 20m. Distribution: Common, locally very abundant on south and west coasts of the British Isles; around southwest Europe to the Mediterranean and probably west Africa. Similar Species: In the past brown individuals of this species have been confused with Aiptasia mutabilis. Long tentacles that are rarely retracted. Smooth column with warts on parapet. Picton, B.E. & Morrow, C.C. (2016). Anemonia viridis (Forsskål, 1775). [In] Encyclopedia of Marine Life of Britain and Ireland.